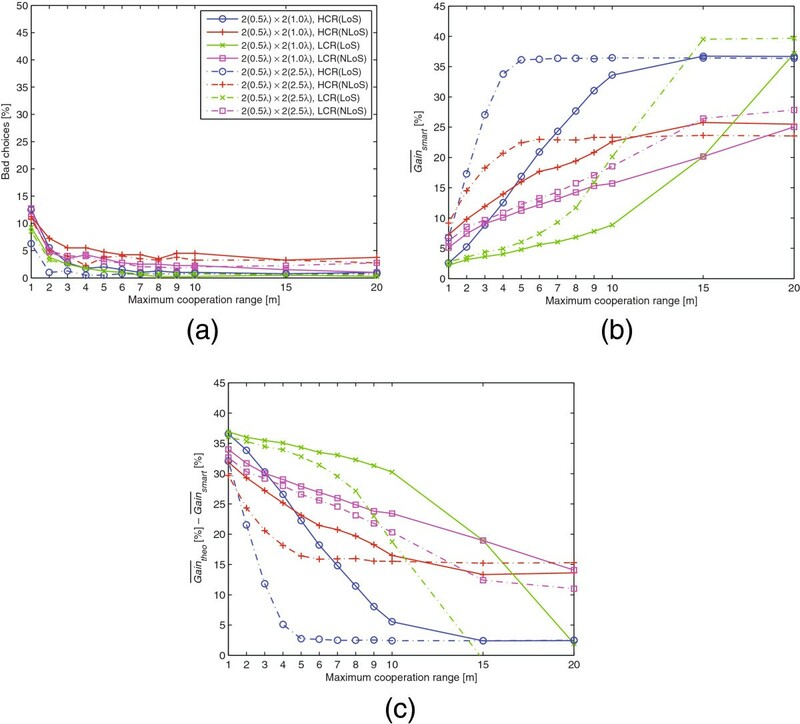 The performance of multiple-input multiple-output systems using spatial multiplexing can be degraded when the spatial information channels are correlated. This work proposes a solution to this problem, which is based on a cooperative wireless communication system. Within the cooperative system, the relay is selected either randomly or using the smart selection scheme, a simple and distributed approach proposed herein. These relay selection schemes are evaluated for several situations within a small cell environment, using a simulator that generates frequency-selective channel realizations. The simulation results show that the smart selection scheme yields high capacity gains close to the theoretical maximum gain. In wireless communication systems, the wavelength and the distance between transmitter and receiver terminals are not the only factors that characterize the radio wave propagation phenomenon. All the interacting objects present in the surrounding environment where waves bounce, as well as their dimension and composition, also contribute to the propagation phenomenon. These interacting objects are usually grouped into clusters and induce scattering, where one or more non-uniformities in the medium force radio waves to deviate from a straight trajectory. Scattering leads to a propagation phenomenon known as multipath propagation, where the transmitted data reach the receiver multiple times by two or more paths and/or at different time instants. These different copies of the transmitted signal, having each one a different attenuation, delay, and phase shift, create an amplified or attenuated received signal power, depending on whether the interference is constructive or destructive, respectively. This is a random process designated as multipath fading, which may vary according to time, space, and/or frequency. Another type of fading is the shadow fading, also a random process due to shadowing from obstacles affecting the wave propagation. Spatial diversity is a powerful technique to mitigate fading and increase link reliability; it combines, in the receiver, different signals from the radio channel, originated by multipath propagation, in order to obtain the source’s stream in better conditions. With this MIMO technique, receiver antennas can provide power gain and, if space-time codes are used, spatial diversity transmission gain can also be achieved. All of this can be reached without requiring channel knowledge at the transmitter, i.e., without channel state information (CSI) prior to any data transmission. Spatial multiplexing is a technique that exploits differences in the spatial signatures (e.g., caused by rich scattering) of multiplexed data streams onto the wireless channel so as to separate the different signals, i.e., orthogonal information channels are created when there is significant spatial decorrelation. This can be seen as an additional spatial dimension for communication that yields a degree-of-freedom gain without additional power, time, or bandwidth. Hence, the system capacity can be increased linearly by a factor n, where n is the minimum number of transmit and receive antennas. This MIMO technique can be used with or without CSI at the transmitter (a system with full CSI can lead to higher spectral efficiencies than a system where CSI is only available at the receiver). The use of MIMO systems in the spatial multiplexing mode may bring improvements in terms of spectral efficiency. However, since the spectral efficiency gain lies on the fact that the user is in the presence of rich multipath, the MIMO spectral efficiency gain will decrease for spatially correlated channels. One possible way to circumvent this problem is to increase the separation among the antennas at a communication end, resulting in a higher antenna decorrelation. For the base station (BS) side, increasing the antenna array size might not be a problem, but for the mobile station (MS) side, a large array could lead to an oversized handset, which is not attractive for a user. A question then arises: if a virtual MS antenna array is considered, i.e., a distributed array, would this solve the correlated channels’ problem? The virtual MS antenna array could be implemented using cooperation among MSs. The basic idea of a cooperative wireless communication system is that each user transmits his/her data, acting also as a cooperative agent for another user, i.e., each terminal works both as a user and as a relay. Using this technique, independent copies of the transmitted signal are traditionally used to combat fading effects through spatial diversity generated in a distributed manner[4, 5]. Since the MSs share their antennas and other resources, the virtual MS antenna array is obtained through distributed transmission and signal processing, which can also be seen as a virtual MIMO system, even for single-antenna terminals. Considering single-antenna systems, relay networks can resemble the spatial diversity of MIMO systems. This has been studied before, and effective protocols like amplify-and-forward (AF) and decode-and-forward (DF) have been defined[6, 7]; in the former, a relay simply amplifies what it receives, while in the latter, a relay decodes, re-encodes, and retransmits the signal. Capacity bounds for single-relay MIMO channels, where every terminal in the network has multiple antennas, were presented in. For a multiple MIMO relay network, where spatial diversity is achieved through cooperation among all the relays available in the network, quantitative capacity results were presented in. In, it was also shown that using relays as active scatterers allows to recover the spatial multiplexing gain in poor scattering environments. A discussion and comparison of different relaying schemes for MIMO terminals were presented in. Based on the AF and DF protocols, the authors proposed another hybrid method, namely filter, amplify, and forward, where the relays apply a spatial filter to the received signals, this filter being based on the CSI obtained only by decoding a training sequence. Some issues arise when using cooperative communication, such as how to select which relay(s) will be used to cooperate and how often they are reassigned. Compared to cooperative diversity schemes where all relays transmit their message to the destination concurrently, several recent results have demonstrated the performance and implementation advantages of one or a subset of relays assisting transmissions in a wireless network[10–21]. With relay selection, the complexity, synchronization, and overhead of the cooperative system are relaxed, leading to an increase in the spectral efficiency. The simplest routing scheme for selecting a cooperation partner corresponds to MSs choosing their relay(s) randomly. The major advantage of this random selection scheme is a very low scheme complexity, resulting in low selection time and signaling overhead. However, choosing the relay(s) randomly might not be very efficient in terms of gain. For frequency-flat fading channels, it was proven in that in some situations no diversity gain can be obtained if the random selection scheme is used, whereas for frequency-selective channels, it was shown in that only in some cases the random relay selection can achieve the same diversity as the best relay selection. Considering single-antenna systems, more efficient relay selection algorithms have been proposed. The authors of presented a centralized method for grouping and partner selection to achieve full network-wide cooperative diversity, in which enough partners are assigned to each transmitter in order to improve the probability of decoding messages successfully. Other works followed a game theory approach to find a solution to the relay selection problem[12–14]; this problem is formulated as a market competition in which multiple relays compete with each other to offer resources (e.g., power, bandwidth) to a single user. In, a power allocation scheme along with a relay subset selection scheme considering generic noise and interference were proposed in order to reduce the signaling overhead required for CSI acquisition. For MIMO systems, a routing scheme based only on the pathloss of the channel was proposed in, which approaches the performance of an optimal routing scheme if the number of transmit and receive antennas or relay antennas is high. In, antenna selection was addressed (i.e., antenna pair selection at the relays) so as to obtain increased performance and low complexity, where the criteria are based on the minimum mean square error (MMSE). A set of joint antenna selection and relay selection algorithms for a variety of MMSE-based reception techniques was proposed in. The previous cited works[10–17], which present relay selection algorithms, only consider frequency-flat fading channels. Nevertheless, broadband communication wireless systems have a transmission bandwidth larger than the coherence bandwidth of the channel, yielding a frequency-selective channel. Taking this fact into account, a power control, bandwidth allocation, relay selection, and relay strategy choice in an orthogonal frequency-division multiple-access (OFDMA) based relay network for single-antenna systems was proposed in. Also, for single-antenna systems, the authors of proposed two relay selection strategies for systems employing orthogonal frequency-division multiplexing (OFDM), one on a per-subcarrier basis and the other on an all-subcarrier basis. Other works, as far as single-antenna systems are concerned, either provided close-to-optimal relay assignment and power allocation across users supported by a single relay or explored the use of relay selection when all channels have inter-symbolic interference. None of the previous studies dealt with relay selection algorithms for MIMO systems in realistic frequency-selective environments (even considering single-antenna systems, only[20, 21] used realistic channel models). Moreover, the research referred above was aimed at obtaining good relay(s) in terms of cooperative spatial diversity. The works either considered algorithms related to the best relay selection (BRS), the simplest selection method which is based on the instantaneous end-to-end signal-to-noise Ratio (SNR), or partial relay selection (PRS) algorithms, i.e., methods in which the relay choice only takes into account the source-relay or the relay-destination SNR. However, when addressing the spatial multiplexing case, both the BRS and PRS approaches are ineffective, and the resulting loss in capacity can be significant, as can be seen in, in which capacity-based selection was also considered. 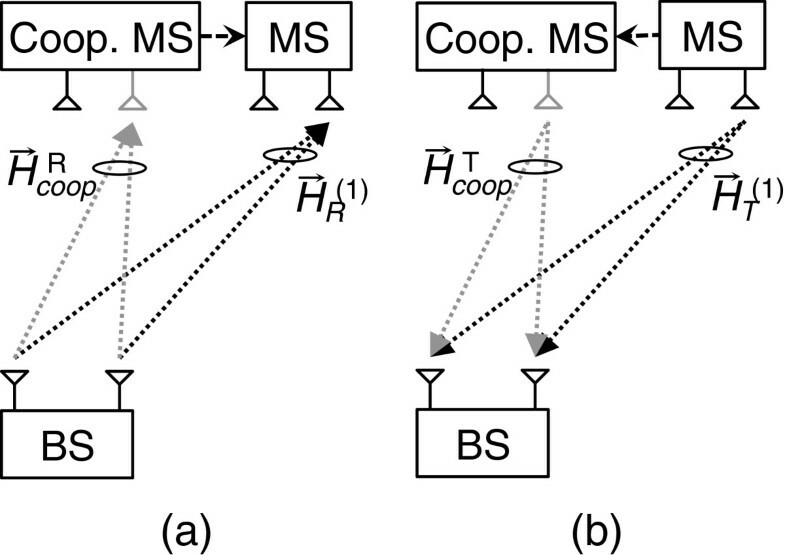 This behavior can be interpreted physically: the goal of a cooperative spatial multiplexing system is to help the receiver to separate the different data streams; thus, it is not good to use the signals from two relays that are highly correlated, even if both have high SNR. The virtual MS antenna array is based on MIMO spatial multiplexing mode. A simple and smart distributed way of selecting a good cooperative agent is proposed. A realistic approach is adopted by using a simulator that generates realistic frequency-selective channel realizations. The rest of the article is organized as follows. Section 2 describes the proposed cooperative wireless communication system, along with the smart selection scheme for selecting the cooperative agent. Simulation results of the capacity gain obtained by using the cooperative system in a small cell scenario are presented in Section 3. Finally, conclusions are given in Section 4. In this section, the suggested cooperative wireless communication system based on MIMO spatial multiplexing mode is first described. Next, the MIMO channel capacity and its bounds are discussed. Afterwards, the smart selection scheme is presented, which is a simple and distributed scheme for selecting the cooperative agent proposed in this work. Some application examples of the suggested cooperative system are given at the end of the section. where s T → ( f ) corresponds to the transmitted signal vector from n T antenna elements at the transmitter, s R → ( f ) stands for the received signal vector at n R antenna elements at the receiver, H ( f ) ∈ ℂ n R × n T denotes the MIMO channel matrix associated with a radio propagation channel snapshot, n → ( f ) represents the additive white Gaussian noise vector, and f corresponds to the carrier frequency. The (r,t)th component of H(f), hr,t(f), represents the link between the t th transmitter antenna and the r th receiver antenna, which depends on the radio environment. where HR,i,k represents a complex value corresponding to the link between the k th BS antenna and the i th MS antenna (hence, H → R ( i ) refers to the signal at the i th MS antenna). Non-cooperative mode (MIMO system with n T = n R = 2 ). (a) Downlink. (b) Uplink. where HT,k,i stands for a complex value corresponding to the link between the i th MS antenna and the k th BS antenna (thus, H → T ( i ) denotes the signal at the i th MS antenna). where H coop , k , i T denotes a complex value corresponding to the link between the i th cooperative MS antenna and the k th BS antenna. Cooperative mode (MIMO system with n T = n R = 2 ). (a) Downlink. (b) Uplink. Within this wireless system, a cooperative MS receives a signal from the BS or from the assisted MS (whether in the downlink or the uplink, respectively) and then forwards this signal to the destination (assisted MS or BS, respectively) without decoding. Besides simplifying the cooperative MS’s work, it is useful from a security point of view since the transmitted data can be encrypted, allowing only the assisted MS, the BS or both to be able to decode the message successfully. We assume that the signals exchanged by a cooperative MS with the assisted MS (related to H → coop R / H → coop T ) can be transmitted using another technology (secondary wireless interface), such as Bluetooth or Wi-Fi, in order to avoid the interference between cooperating terminals and the communication with the BS (main wireless interface). Also, we assume that the MS can only select relays which are able to decode the messages exchanged in the secondary wireless interface successfully. This can be achieved if each message is followed by a cyclic redundancy check (CRC) code and if the relays that receive corrupted messages report that they are unable to help the MS. As an example, consider the downlink scenario of the suggested cooperative system, in which the selected relay receives a signal from the BS in the main wireless interface. This signal is then encapsulated using the technology of the secondary wireless interface and, finally, it is forwarded to the assisted MS. The same idea is already put into practice, allowing smartphones to work as Wi-Fi hotspots (secondary wireless interface), while the Internet connection is established through a cellular operator (main wireless interface). In a perfect exchange of information between a cooperative MS and the assisted MS, when a MS is assisted by using the proposed cooperative system, one or more antennas of the assisted MS are a few meters away from the MS position, yielding a virtual MS antenna array. As stated in the introduction, systems with full CSI can yield higher spectral efficiencies, i.e., higher channel capacities. Unfortunately, obtaining channel knowledge at the transmitter is not an easy task. Hence, in this work, only systems without CSI at the transmitter will be considered. where tr(·) corresponds to the trace function. With this matrix normalization, the channel attenuation is reflected in the SNR, allowing the influence of the channel correlation properties on the channel capacity to become visible. n = min ( n T , n R ) . C = ∑ i = 1 n log 2 1 + SNR n T γ i .
where C q stands for the q th subchannel capacity. C min = log 2 1 + n R SNR . C max = n log 2 1 + SNR n R n .
The derivation of these bounds is presented in the Appendix. The optimal selection scheme would be the one that always chooses the relay that yields the highest cooperative capacity gain. This could be achieved if a MS compared all the cooperative capacities provided by the cooperative MSs before the best relay is selected. However, this scheme might conduct to high signaling overhead, since capacity tests have to be performed for every flat-fading subchannel. Also, the time required for this procedure might lead to a non-viable solution because the channel matrices corresponding to the tested channel realizations might change in the meantime. det ( W q ) = ∏ i = 1 n γ i , q .
arg max γ i , q ≥ 0 ∑ i = 1 n γ i , q = n T n R det ( W q ) ⇒ γ i , q = n T n R n , ∀ i. Noticing that the maximum channel capacity value is also obtained when all eigenvalues have the same value (c.f. (32) in the Appendix), from (17), we conclude that a higher determinant value of the channel correlation matrix leads to a higher capacity value. W q , virtual = H R / T , virtual ( f q ) H R / T , virtual † ( f q ) n R ≤ n T H R / T , virtual † ( f q ) H R / T , virtual ( f q ) n R > n T .
so that the MS can have an easier procedure and compute only |det(Hvirtual)| for each cooperating terminal, choosing, in the end, the relay that yields the highest determinant absolute value of HR/T,virtual(f q ). Since the choice is based only on one flat-fading subchannel (e.g., the signal corresponding to an OFDM pilot channel), the proposed scheme is not optimal; hence, bad choices will still be made if, for cooperating terminals, this specific subchannel is not much correlated and if the other subchannels are highly correlated. On the other hand, less overhead and time are required for the selection procedure, not only because less tests are performed (for only one instead of all subchannels), but also because it is computationally simpler to test the determinant than the capacity expression (12), which even for a MIMO square matrix always requires matrix multiplications. The smart selection scheme requires the MSs to have the subchannel CSI, which could be hard to implement in the uplink (where MSs are transmitters); however, in the downlink this CSI is already available at the MSs (acting as receivers) since it is required for data transmission using MIMO spatial multiplexing. Therefore, the smart selection scheme can be considered as being distributed for the downlink transmission, as no processing is needed at the BS (for the uplink, the BS would have to feedback the CSI that it is experiencing as a receiver). From a security point of view, the proposed scheme requires only the cooperative agents to decode the training sequence of only one frequency subchannel, and so these are the only data that must be available to all users. Broadcast situations are cases for which the suggested cooperative system is well suited. For instance, consider a BS, on a football stadium, broadcasting TV replays for the spectators to watch on their handsets. The signal received at one of the MS’s antenna could be used not only for receiving data in this MS, but also as the cooperating signal for a partner, so all users would easily enhance their channel capacity by using this cooperative system instead of using their real antenna arrays. Additionally, the smart selection scheme is straightforward to implement: as the receiver CSI needed for MIMO transmission is always computed by all the MSs, the CSI required by this scheme is already available. Single-antenna MSs can also use the proposed cooperative system to enhance their channel capacity, but there is a drawback: since the BS transmission is envisioned for a MIMO system using spatial multiplexing (each communication end requires a minimum of n antennas for the n × n MIMO), cooperation would be essential for data transmission (the option to fallback to co-located antennas would not be available). However, this can also be seen as a way to encourage cooperation. This section provides simulation results for the capacity gain obtained using the proposed cooperative communication system in a microcell scenario, which is one of the environments encompassed by small cells. First, the MIMO channel model and test environment are presented, followed by the capacity gain results using the random selection and the smart selection schemes for selecting the cooperative agents. A comparison between these relay selection schemes, the optimal exhaustive search scheme, and a greedy selection scheme is provided at the end of the section. Given a channel model that generates channel impulse responses (CIRs), a Fourier transform is applied to the CIRs in order to compute H(f). In this work, the CIRs are generated using a validated implementation of the COST 273 channel model for microcell scenarios. This channel model uses time-delayed multipath replicas of a transmitted signal to simulate the signal that a MS receives. These replicas have their origin in M clusters of scatterers; these scatterers are stochastically generated within the channel model. Each cluster is characterized by L multipath components (MPCs), with each MPC having an associated angle of departure (AoD), angle of arrival (AoA), power, and delay. where τm,l corresponds to the (m,l)th MPC’s excess delay regarding the line-of-sight (LoS) radio path. With this formulation, several MPCs can be contained within a delay bin and, depending on their phase relationship, small-scale fading occurs due to either constructive or destructive interference. The small cell test environment is characterized by a BS located at the center, (x,y) = (0,0), of a 100 m × 100 m microcell area. Following the conclusions of[27, 28], where it was shown that the capacity values are higher for regions which are transverse to the plane defined by the BS antenna array, reference MSs are placed in positions (x,y) = (±25,0) m, which are in a high capacity region (HCR), and in positions (x,y) = (0,±25) m, which are in a low capacity region (LCR). Possible cooperative MSs are positioned around the reference MSs up to a maximum range of 10 m, being evenly separated from each other by 1 m. The BS and the MSs antennas are at a 10 and 1.5 m height, respectively. The MIMO configuration used for the simulation is characterized by a 2 × 2 antenna array setting with 20 MHz bandwidth, which is one of the long-term evolution configurations. The operating frequency is set to 2 GHz and two spacings between the antenna elements are assumed as reference scenarios: one with a spacing of 0.5λ and 1.0λ for the MS arrays and the BS array (2(0.5λ) × 2(1.0λ) MIMO), respectively, and another with a spacing of 0.5λ and 2.5λ (2(0.5λ) × 2(2.5λ) MIMO), respectively. Taking into account the frequency-selective feature of the channel, the simulated MIMO channel matrices are split into Q = 512 subchannels, i.e., each subchannel has a bandwidth of 39.0625 kHz, which corresponds to the coherence bandwidth of channels that have a delay spread of 12.8 μs. In order to simulate a bad channel in terms of attenuation experienced by the MSs, a SNR of 5 dB is used in (12), in all experiments. To simulate inter-link correlation among different MSs properly, the simulator simultaneously generates, in a given simulation run, the radio channel snapshots for all the MSs. All the following results are based on 200 simulations runs, where each run corresponds to a different propagation scenario. Considering the LoS and the non-LoS (NLoS) situations, Table1 presents the average channel capacity, C ¯ real ( [ · ] ¯ represents the average operation), obtained by the reference MSs using the real antenna array (non-cooperative mode, i.e., using HR/T). Gain ¯ theo = C max C real − 1 ¯ . The values presented in Table2 will be used to evaluate the performance of the random selection and of the smart selection schemes. where Cvirtual,random stands for the capacity obtained using a virtual MS antenna array (cooperative mode, i.e., using HR/T,virtual) with the random selection scheme. Cumulative distribution of the cooperative capacity gain. The distribution was obtained using the random selection scheme (Gainrandom), 2(0.5λ) × 2(1.0λ) MIMO, and up to 5 m of maximum cooperation range. From Figure3 we can conclude that for about 20% of the cases (a reference MS either in a HCR or in a LCR, with or without LoS), it is a bad choice to use cooperation. However, it can be argued that if the average cooperative capacity gain ( Gain ¯ random , which considers both positive and negative gains) is high, then the cooperation should be used. 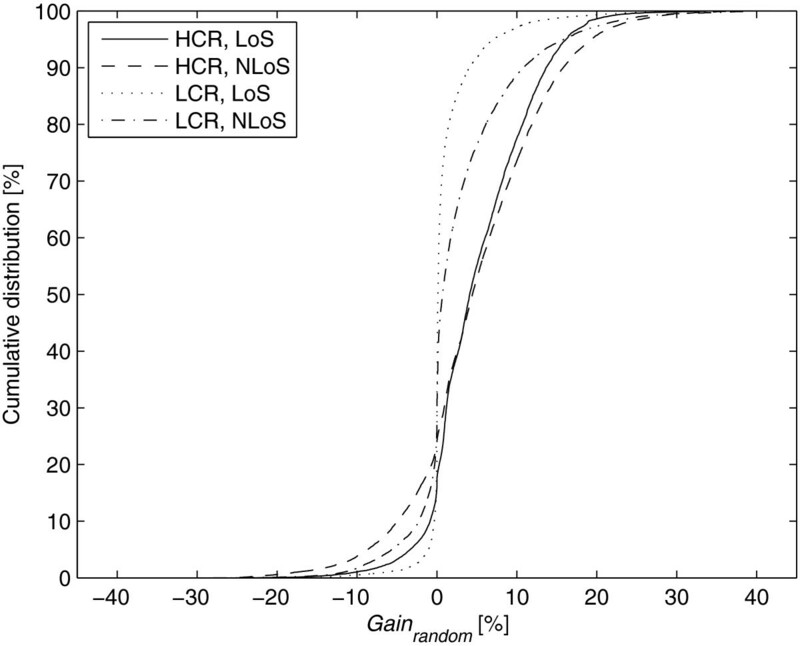 Having this in mind, Figure4 presents, for several maximum cooperation ranges, a comparison of the bad choices’ percentage, along with the average cooperative capacity gain, Gain ¯ random , and also the difference between this gain and the theoretical maximum cooperative capacity gain presented in Table2, Gain ¯ theo − Gain ¯ random (since Figure4a,b,c share the same legend, this is only shown in the first figure for the sake of readability). Random selection scheme. (a) Bad choices. (b) Average cooperative capacity gain ( Gain ¯ random ). (c) Difference between the theoretical maximum and the obtained cooperative gain ( Gain ¯ theo − Gain ¯ random ). These results show that when the maximum cooperation range increases, not only the percentage of bad choices decreases but also the average capacity gain generally increases. 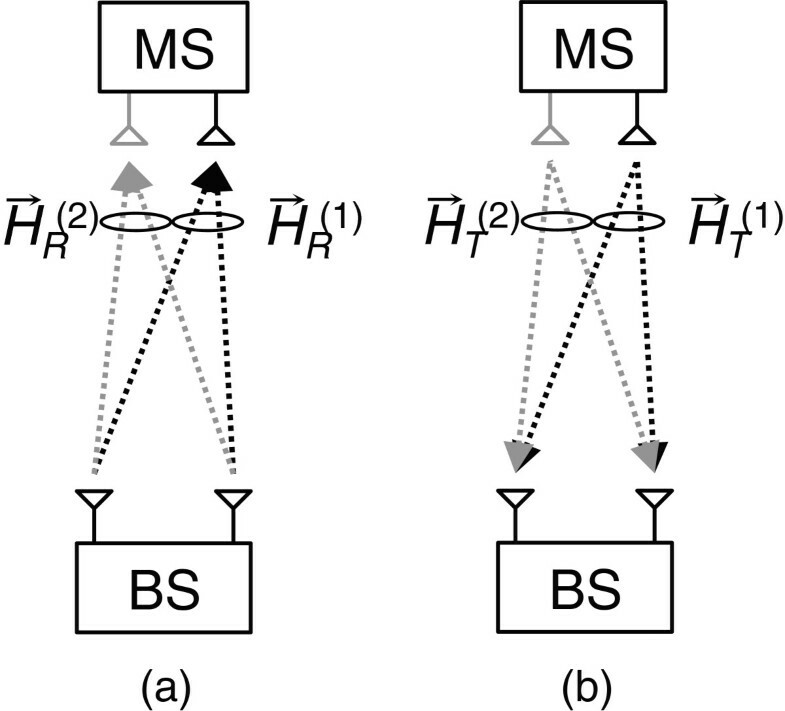 This was expected, as more cooperative MSs with a higher degree of channel decorrelation regarding the reference MS are being considered; yet, also more cooperative MSs with a negative effect become available and can, in some cases, start lowering the gain (e.g., 2(0.5λ)×2(2.5λ) MIMO, with the MS in a HCR). From Figure4c, we can conclude that although this cooperative system yields a capacity gain with the random selection scheme, this gain is not enough to solve the correlated channels’ problem since there is at least a 15% margin of improvement for all the situations under consideration. Figure5 presents the resulting bad choices’ percentage for the smart selection scheme, along with the average cooperative capacity gain, Gain ¯ smart , and also the difference between this gain and the theoretical maximum cooperative capacity gain presented in Table2, Gain ¯ theo − Gain ¯ smart . Smart selection scheme. (a) Bad choices. (b) Average cooperative capacity gain ( Gain ¯ smart ). (c) Difference between the theoretical maximum and the obtained cooperative gain ( Gain ¯ theo − Gain ¯ smart ). These results show that the smart selection scheme is much better than the random scheme, yielding a lower percentage of bad choices and a higher average cooperative capacity gain; additionally, this gain never decreases as the cooperation range increases. In spite of the fact that this selection scheme is not optimal, since bad choices are always made (see Figure5a), we can conclude from Figure5c that the smart selection scheme yields near-optimal results, because for some of the considered situations the difference between the theoretical maximum gain and the achieved gain is less than 5%. As an example, for the reference situation 2(0.5λ) × 2(2.5λ) MIMO, with the MS in a HCR with LoS, the gain difference is less than 2% if at least a 5 m cooperation range is assumed. 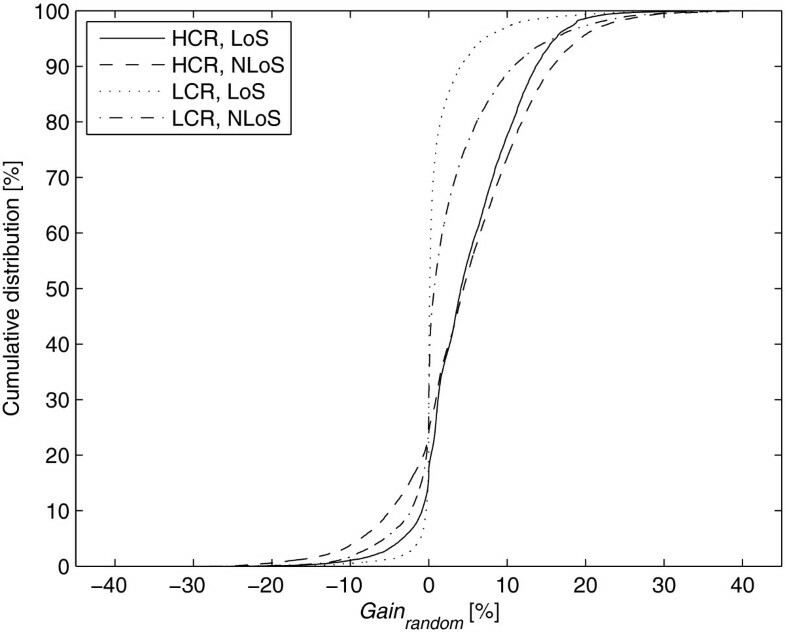 Considering the reference situation 2(0.5λ) × 2(1.0λ) MIMO, with the MS in a HCR with LoS, Figure6 presents a comparison of the average cooperative capacity gain obtained using four different relay selection schemes: random selection ( Gain ¯ random ), smart selection ( Gain ¯ smart ), exhaustive search ( Gain ¯ max ), and greedy selection ( Gain ¯ greedy ); the theoretical maximum cooperative capacity gain ( Gain ¯ theo ) is also shown. The exhaustive search corresponds to the optimal relay selection scheme, where the reference MS compares all the cooperative capacities, i.e., capacities for all flat-fading subchannels provided by all the cooperative MSs, and then chooses the relay that yields the highest global cooperative capacity. The greedy selection scheme corresponds to an adaptation of the method presented in for the suggested cooperative system. First, the MS computes the cooperative capacity value (base value) using one relay, for all flat-fading subchannels. Next, it chooses another relay and, afterwards, it computes the new cooperative capacity value. If the new value is higher than the base value, then the MS adopts this new capacity value as the base one and repeats the previous procedure; otherwise, if the new value is lower than the base value, the MS stops the search for a better cooperative capacity value and selects the relay corresponding to the current cooperative capacity base value. 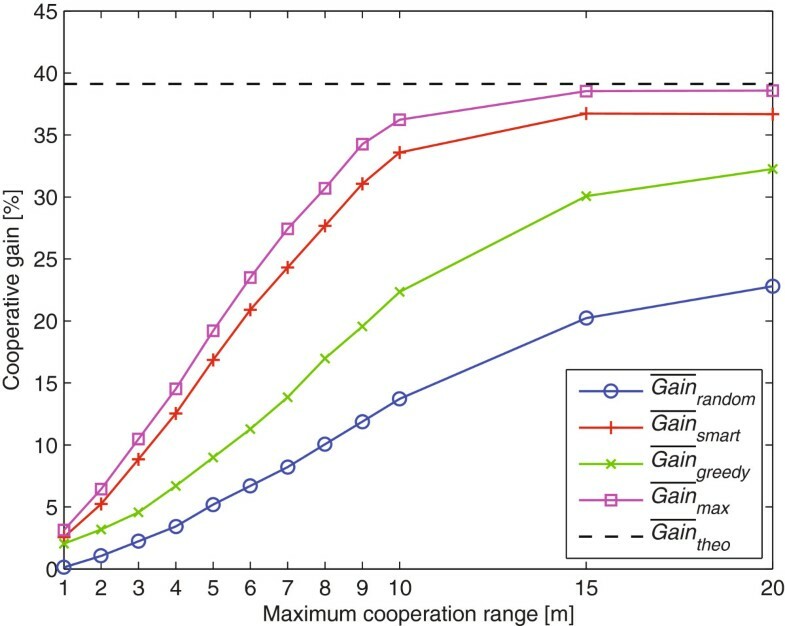 Average cooperative capacity gain comparison between different relay selection schemes. 2(0.5λ) × 2(1.0λ) MIMO, with the MS in a HCR with LoS. By observing Figure6, it can be seen that the performance of the smart selection scheme is only overtaken by the exhaustive search scheme, but still the cooperative gain difference between these two schemes is much lower than the resulting gain difference using the other relay selection schemes. Similar results were obtained for other reference situations. These results are even more interesting if we analyze the complexity required by the selection schemes: considering a MIMO square matrix (n T = n R ) and a certain number Nrelay of available relays, the exhaustive search requires Nrelay × Q matrix multiplications plus Nrelay × Q determinant computations, besides Nrelay−1 comparisons; the greedy selection requires at least 2 × Q matrix multiplications plus 2×Q determinant computations and one comparison, and at most the same as the exhaustive search; the smart selection only requires Nrelay determinant computations, besides Nrelay−1 comparisons (c.f. Section 2.3). Since the number of flat-fading subchannels (Q) is usually much larger than the number of available relays (Nrelay), we can conclude that the smart selection yields a good tradeoff between complexity and performance. In the presence of spatially correlated channels, MIMO systems that use spatial multiplexing have their performance affected and experience a lower channel capacity than expected. In this work, two relay selection schemes within a cooperative wireless communication system were evaluated so as to deal with the correlated channels’ problem. Besides considering the trivial random selection scheme, a simple and distributed relay selection scheme, smart selection, is also proposed. 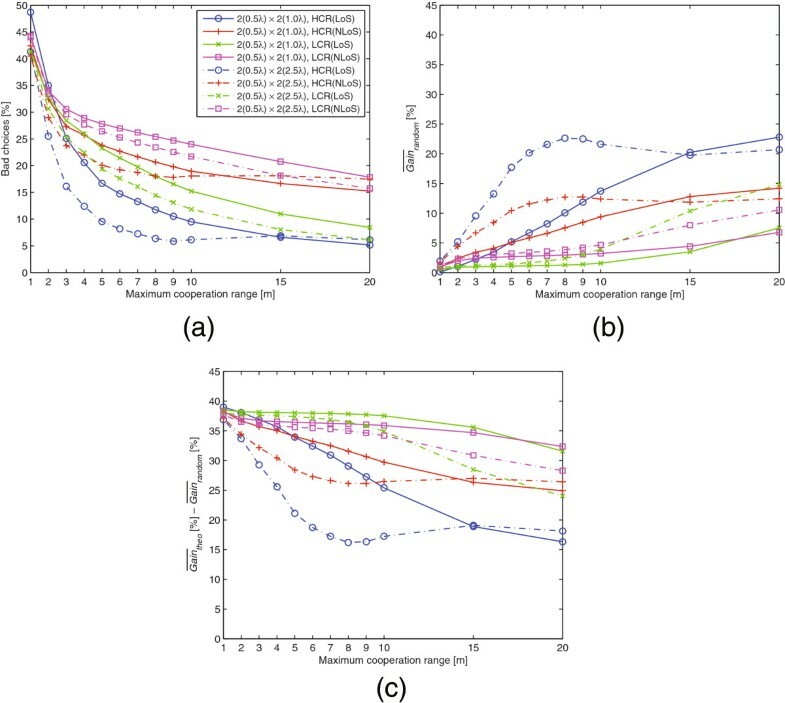 Simulation results show that the cooperative system using the smart selection scheme can improve the channel capacity and mitigate the correlated channels’ effects, yielding capacity gains close to the theoretical maximum gain. tr ( W q ) = ∑ i = 1 n γ i , q . ∑ i = 1 n γ i , q = n T n R .
γ i , q = n T n R i = 1 γ i , q = 0 i ≠ 1 , ∀ q. C min = 1 Q ∑ q = 1 Q log 2 1 + SNR n T n T n R = log 2 1 + n R SNR . C min ′ = 1 Q ∑ q = 1 Q log 2 1 + SNR n T ( n T n R − ε ) + log 2 1 + SNR n T ε = log 2 1 + n R SNR + SNR 2 n T 2 ε ( n T n R − ε ) . C min ′ < C min ⇒ 1 + n R SNR + SNR 2 n T 2 ε ( n T n R − ε ) < 1 + n R SNR ⇒ ε ( n T n R − ε ) < 0 ⇒ ε < 0 ∨ n T n R < ε . Since ε must be positive (c.f. (29)) and recalling that the eigenvalues are always non-negative (so ε can never be greater than n T n R , c.f. (29)), it follows that (31) is false. Hence, Cmin is indeed the minimum channel capacity value. γ i , q = n T n R n , ∀ i , q. C max = 1 Q ∑ q = 1 Q ∑ i = 1 n log 2 1 + SNR n T n T n R n = log 2 1 + SNR n R n n = n log 2 1 + SNR n R n .
C max ′ = = 1 Q ∑ q = 1 Q log 2 1 + SNR n T n T n R n − δ + log 2 1 + SNR n T n T n R n + δ + ∑ i = 3 n log 2 1 + SNR n T n T n R n = log 2 1 + SNR n R n − δ n T 1 + SNR n R n + δ n T × 1 + SNR n R n n − 2 = log 2 1 + SNR n R n n − 1 + SNR n R n n − 2 SNR δ n T 2 . C max ′ > C max ⇒ 1 + SNR n R n n − 1 + SNR n R n n − 2 × SNR δ n T 2 > 1 + SNR n R n n ⇒ − 1 + SNR n R n n − 2 SNR δ n T 2 > 0 . Since all the variables in (36) are greater than zero, this expression is false. Hence, Cmax is indeed the maximum channel capacity value. This work was partially funded by Instituto de Telecomunicações/LA and by Fundação para a Ciência e a Tecnologia (FCT) under a doctoral grant (SFRH/BD/62003/2009).